…with YouTube and Facebook for all. High speed Internet connectivity has become so important in the last few years that it is considered an essential utility rather than a convenience. Just as if one’s electricity, water, or gas were to become unavailable, an Internet connection may cause hardship if it were suddenly to go down. Today’s Internet isn’t just for browsing: it’s for college courses, powering their home security systems, supplying their phone service, providing local news and severe weather updates, leaving self-indulgent 140 character summaries of ones activities…it’s integration with our lives has outgrown its original vision. As such, a high-speed reliable connection should be available everywhere. “Government mismanagement!”, “Greedy tel-coms!”, “Anti-competitive business!” are all reasons I hear, but the actual answer is something people don’t usually consider. DSL – “Digital Subscriber Line” consists of a high-frequency signal that is broadcast over a standard phone line. DSL comes in two varieties: “Line Share” and “Dry Loop”. Line Share means active phone service and DSL are being broadcast on the line at the same time. Dry Loop (also called Dry Pair or Naked DSL) means there is no active phone service, but you still have the DSL signal being broadcast over the line. Since the U.S. has had over a century to expand its phone network, DSL is widely available (in fact it’s one of TOAST.net’s most popular products). Unfortunately the signal only has a range of about 3 miles it’s source. Also, some phone companies do not have the equipment or licensing to carry a DSL signal. These factors can make service availability spotty. Cable – Cable Internet has been around nearly as long as DSL and is typically provided by your local cable TV provider. It is not as range limited as DSL, but it does tend to be more expensive. Also, most cable companies will not expand into new areas unless the customer pays for it. If you live in an outlaying area installation costs can run into the thousands of dollars. Wireless – This includes WiFi, satellite, and cellular 3G and 4G connections. It’s available in more areas than DSL and cable, and it’s probably the easiest to set up as you just turn on your wireless device and it works. However, the connection tends to be slower and less reliable than a connection involving a physical line. Something else to consider is many of these plans have relatively low data caps on them, making sharing a single connection expensive or impractical for network connectivity. So what’s a dial-up user to do? Why aren’t providers spreading their service to all those unserviced customers across the country? Smaller countries like Singapore, Japan, and especially South Korea (which, by the way, is the best Korea) already have standard 10.0Mb connections available anywhere. The U.S. struggles to get 1.0Mb to many areas. The main reason for this is something most people over look, a principle I call I.H.C.F.- “Internet Hates Corn Fields”. The U.S. is a huge country. Not Canada or Russia huge, but it’s up there. Since it’s so large, edges of the country tend to house the largest cities, with sprawling undeveloped bald spots in the middle. You could say the U.S. is designed much like my head (I’ve still not accepted middle age). Since people flock to things like jobs, coastlines, and 45 minute traffic jams, population density tends to be highest in these areas. A high population means a lot of people that want to pay someone to maintain a network. Due to I.H.C.F., the Field of Dreams mantra “If you build it, they will come” doesn’t work with network construction. Help is on the way (hopefully)! The Government recently finished is Map of Broadband Availability, which basically shows the haves and have-nots in the U.S.. The “have-not” areas are going to be targeted for the Obama Administration’s Wireless Broadband Initiative, which is supposed to supply funding for wireless networks in under-serviced areas. This means that you may finally be able to watch those forwarded “Watch this guy suffer a crotch injury!” YouTube links anywhere you go within the next few years. 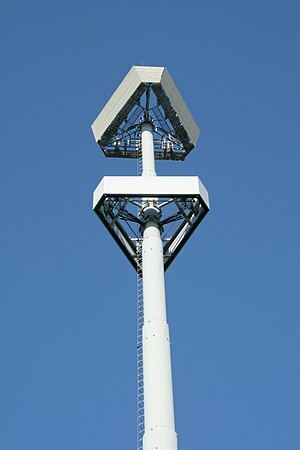 New advancements in cell tower miniaturization should make deployment easier for those involved, faster and less expensive deployments. Just cross your fingers that funding doesn’t get diverted to other programs like so many other hopeful initiatives (I’m talking about you “Fund to Hunt for Radioactive Rabbit Droppings” supporters). So, high-speed Internet isn’t available everywhere yet, but at least the problem has finally been mapped out and a plan is coming together to deal with it. In the mean time, if your Facebook wall is loading too slowly, blame corn. Where we are we can NOT get any broadcast radio or TV and we are in a mountain valley where we can not get satellite radio or TV either. So in effect we can NOT get anything but dial up, that’s it. We have even tried to get satellite PHONE service, satellite INTERNET service, satellite TV service and satellite RADIO service and in each case we are told that if we can get the forest service to cut a piece about 900 feet in height and about 4 miles in length off the mountain that is South East of us we will be able to get all these services and of course there is NO CELL PHONE SERVICE in this valley at all. We have even tried to have a dish type system installed on he top of the mountain but that would be and been told that we would have problems with snow building up on the dishes, that they just won’t work when they are snow covered and that anyway it would be prohibitive as there is no power within about 22 miles of where it would need to be and it would cost over a MILLION dollars to get power to the site partly because there isn’t a road not even a jeep trail within 20 miles of the site. We were also told that SOLAR would not be an option as that mountain gets an average of over 28 feet of snow a year and that there is no way of keeping the solar cells clear of snow and that they won’t work at all when snow covered. So we didn’t even check on what it would cost to put the dish up there. It was just a thought anyway. So that leaves us down here in the valley without anything but dial up and we know that dial up will gradually go away as most of the nation goes to all the newer systems, And for sure we are not any where near the only ones that have this kind of a situation there are thousands in the country that have a situation about like I just described. A few things to consider about dial-up service is some of the compression tools and call waiting tools now available with most dial-up providers. While population density does make it very expensive to bring high-speed to more rural areas, basic web browsing (sorry, no youtube or espn) and email does work relatively well on a good dial-up connection using a web accelerator. Now you even have Call-Alert software that notifies you of inbound phone calls when on dial-up. So all is not lost; I expect compression tools, better browsers, and website design to make the dial-up experience better than 15 years ago, but nonetheless it is still dial-up. Previous Previous post: The future of computing: no more computers!